the Board is encouraged by the Company's recent performance and in keeping with our commitment to act in the best interests of all shareholders we believe at this time that it is prudent to explore strategic alternatives to determine the best opportunities for enhancing shareholder value. ETC's Board has established a special Committee to explore and evaluate strategic alternatives. Potential strategic alternatives that may be explored or evaluated as part of this process include, among other possible alternatives, the potential for an acquisition, merger, business combination, or other strategic transaction involving the Company. Ms. Tartar has been the Chief Financial Officer for the Lenfest Group, LLC, since January 2000 responsible for the oversight of a diverse portfolio of companies. 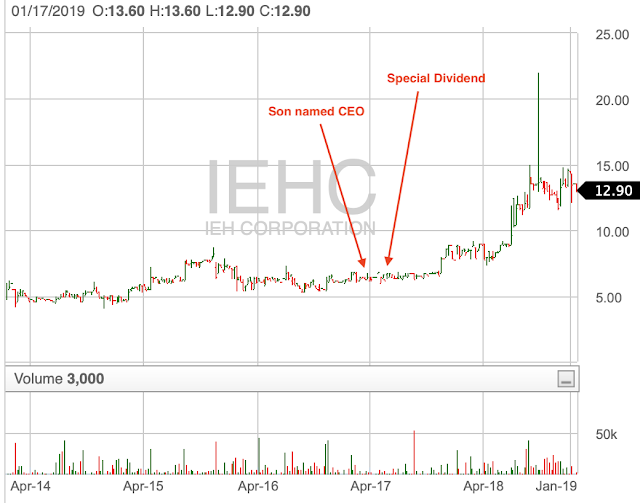 Ms. Tartar stated, "I look forward to working with the ETC Board and management team to contribute to a strategic plan that leverages the Company's strengths and creates value for all shareholders. Since then they've said nothing. We are left to wonder what is happening behind the scenes and what may happen to the stock. Look at the stock response! It was exciting enough news to triple before boredom and impatience took over. Now the stock sits back where it was. One clue is what happened to another majority owned Lenfest company, Telvue Corp (TEVE). Lenfest owned 91.9% of TEVE and guess who else was on the board...Joy Tartar. Lenfest was a director since 1989 and owned TEVE through a combination of preferred and common stock. In Dec 2012 TEVE filed the dreaded Form 15 to de-register from the SEC. I don't know if they sent financials or any sort of info to shareholders but they stopped posting with the SEC. The next big news came in Jan 2018 by restructuring into an employee owned corporation. FINRA shows the stock symbol as deleted on Jan 26, 2018 and notes, "Company Dissolved. 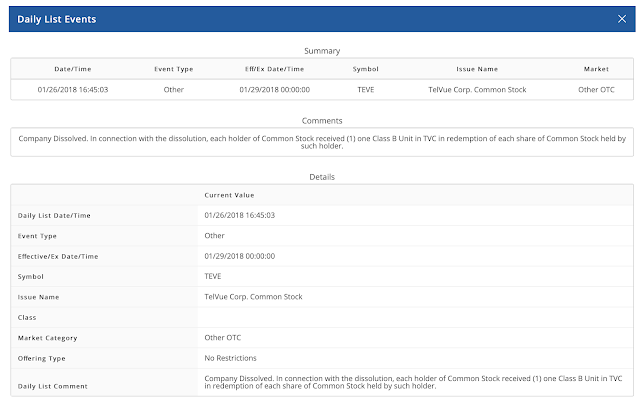 In connection with the dissolution, each holder of Common Stock received (1) one Class B Unit in TVC in redemption of each share of Common Stock held by such holder." TVC, LLC will make distribution payments to members (you are a member) based first on the priority between classes. 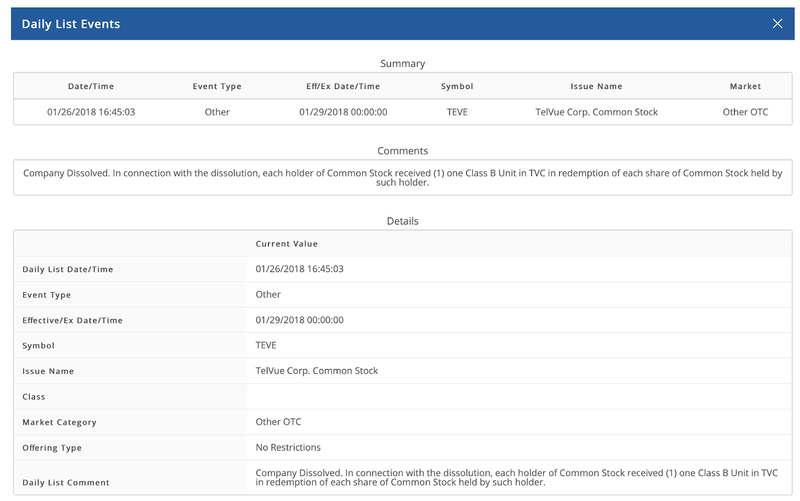 As stated in the Stockholder Notice, any possible distributions to Class B Members will only begin after all of the payments received by TVC, LLC less expenses has exceeded the unpaid Capital Contribution and Preferred Return due to the Class A Member. The Capital Contribution and Preferred Return due to the Class A Member currently is approximately $6MM. After the aggregate preference owed to the Class A Member is fully satisfied, any additional distributions made by TVC, LLC would be made on a pro rata basis based on percentage interest of all of the Class A and Class B Members, taken together. I don't know if TEVE shareholders were treated fairly because I don't have any TEVE financials. What I do know is Lenfest was majority owner for decades then he sold out in Jan 2018. Lenfest held all of the preferred in TEVE and had Tartar with him on the board. Lenfest again holds all of the preferred in ETCC plus he's the majority shareholder and Tartar is on the board. In Sept 2017 ETCC announces strategic alternatives, 4 months later TEVE is sold, and 7 months after that Lenfest dies. Lenfest is a famous philanthropist with his own wikipedia page. Of course I don't know what his dying wishes were but it sure seems like change is coming. 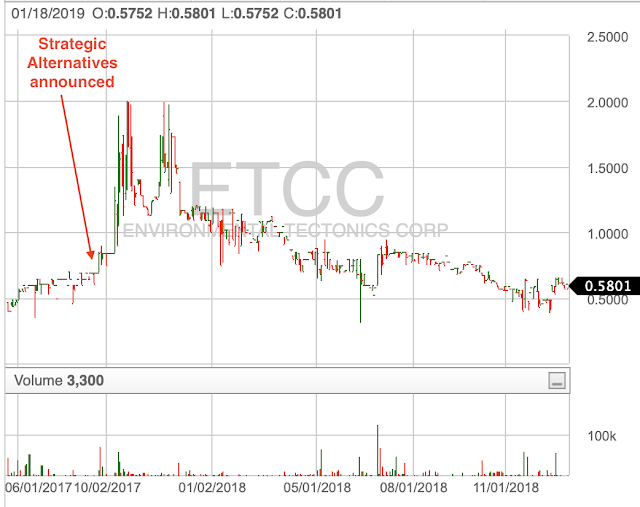 Maybe ETCC will sell out completely to some larger entity. Maybe someone will buy up Lenfest's 54% of the company. Even if nothing happens we have a new person calling the shots. Someone other than Lenfest is in charge for the first time in decades. 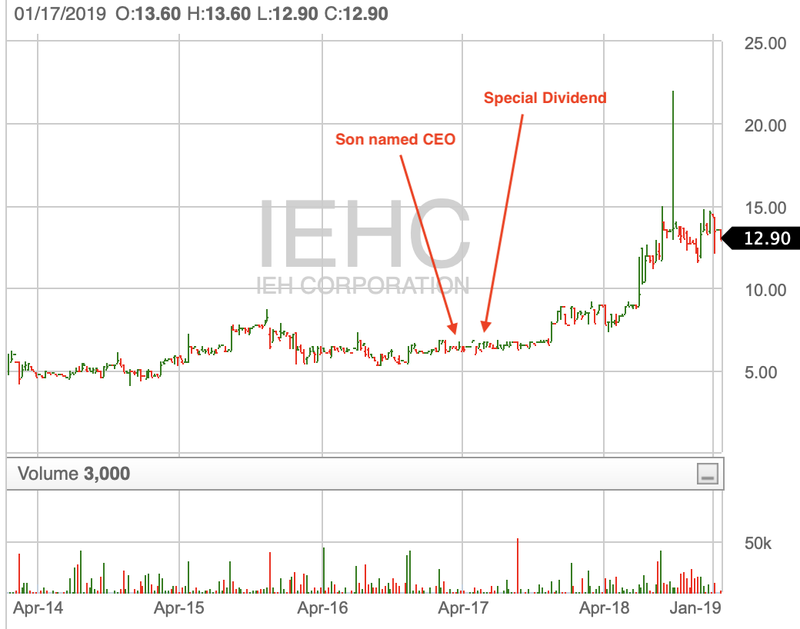 I am not saying ETCC will double like IEHC or HYDI. I don't know what will happen. The point is change and all I'm saying is think of the possibilities. New management brings new ideas, new hunger, new motivation. We are a significant supplier and innovator in the following areas: (i) software driven products and services used to create and monitor the physiological effects of flight, including high performance jet tactical flight simulation, upset recovery and spatial disorientation, and both suborbital and orbital commercial human spaceflight, collectively, Aircrew Training Systems (“ATS”); (ii) altitude (hypobaric) chambers; (iii) hyperbaric chambers for multiple persons (multiplace chambers); (iv) Advanced Disaster Management Simulators (“ADMS”); (v) steam and gas (ethylene oxide) sterilizers; (vi) environmental testing and simulation systems (“ETSS”); and (vii) hyperbaric (100% oxygen) chambers for one person (monoplace chambers). We operate in two primary business segments, Aerospace Solutions (“Aerospace”) and Commercial/Industrial Systems (“CIS”). We are pleased to announce the U.S. Air Force acceptance of its ATFS-400-31, the most sophisticated human centrifuge in the world today. The U.S. Air Force will use the centrifuge for training its pilots to withstand G-forces, and for research purposes. We are also continuing to see significant international opportunities for our Aircrew Training Systems, where the international community continues to invest in high performance aircraft, which then requires an investment in aeromedical and other forms of training for pilots to fly safely. The offerings in this line have been extended to include the supply and integration of various independent testing systems for the automotive industry. These include 4-Post Shakers, Roller Shakers, Solar (IR & Full Spectrum) Simulation, and Altitude Simulation. Another factor in this growth has been the positive reputation and repeat business that results from many successful recent projects that have positioned ETC to be viewed as a reliable, high quality supplier of automotive test equipment. Disaster Management and Homeland Security Training organizations (ADMS-COMMAND & ADMS-POLICE), Airport Fire Truck manufacturers (ADMS-ARFF), and military customers (ADMS-AIRBASE). ADMS-COMMAND / POLICE / AIRBASE are all systems to train command and control from on-scene responders up to strategic command level. ADMS-ARFF simulators are used to train tactical vehicle positioning and operating the on-board firefighting equipment. On the negative side they have $20.1M in long term debt and a growing amount of unpaid dividends. Lenfest owns all the preferred. The pref has a 4% annual divided = $484k with $2.4M now unpaid. It converts to common at $1.98 but that's not really a concern since the stock sits at $0.60 right now. I'd love for the stock to get high enough for conversion! The way I think about this preferred is what it would cost to buy out in a company sale. Think of what happened with TEVE...the company sold and pref gets paid first. In 2012 the company bought back a bunch of series D and E preferred for $1000 per share (see page 23 here). Lenfest holds series E now so if we use that $1k per share price the pref is worth $12.1M. Based on the numbers above I'll go with a company value of $40M total. 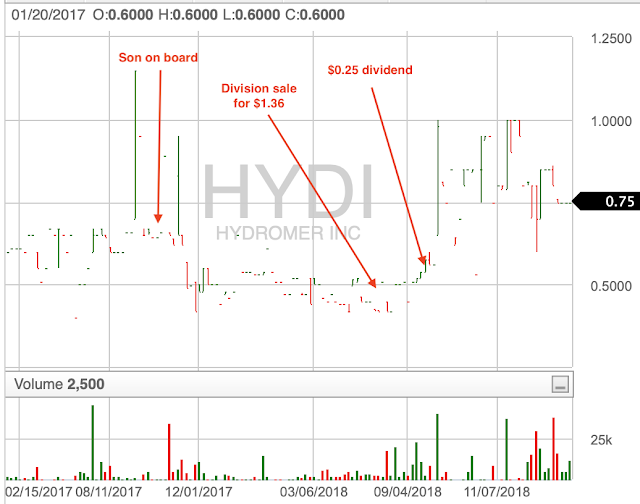 Subtract out $12.1M to buy the pref and $2.4M to pay the back dividends leaves us with $30.5M for the common shareholders = $2.77 per share. The latest price is $0.58. Look where the stock ran when people thought a sale was imminent. The reason for the low price could be that this company was not so profitable in the past in combination with relativly high debts. The company shows an accumlated deficit (usually this means low earnings in the past) and earnings of 2.4 Mio. (2018), -0.92, -10.8, -3.7. Further, operating cash flows and FCF were also not great. The most interesting point is probably the change. The easier way to value it, is $3M in Earnings. sold for 10x multiple - it's a microcrap after all! compared to the stock at $0.58 today. What you think of this math Dan? $12M is what I think it'd cost to pay off the preferred so you'd have to add that to the debt on the balance sheet. If the company is sold first the debt gets paid off then the preferred is entitled to their pay off and then what's left goes to common. I should have included more of this in my write up the first time. Sometimes I move too quickly past the math because the chart and situation seem right to me. So let's slow down and say a sale price of 1x revenue = $47M. First we pay off the $20M long term debt then buy out the preferred for $12M and pay off the accrued dividends to the preferred of $2.4M. What's left is for the common. So (47-20-12-2.4)/9.2 = $1.37 per common share. Of course you can argue about the sale price whether 1x revenue or 0.85x revenue or some EPS multiple is right. I don't know the answer. Also the debt is growing and now that I look back the long term debt is 22.6M in the latest Q out almost two weeks ago. And the preferred dividends are up to $2.8M. So if we use these latest numbers then it's (47-22.6-12.1-2.8)/9.2 = $1.03 per share. Oh I see, the debt doesn't include the preferred. Then you can work backwards to see what multiple is being priced in. So firm value implied = $40M approx. Possibly some upside only because of the leverage. 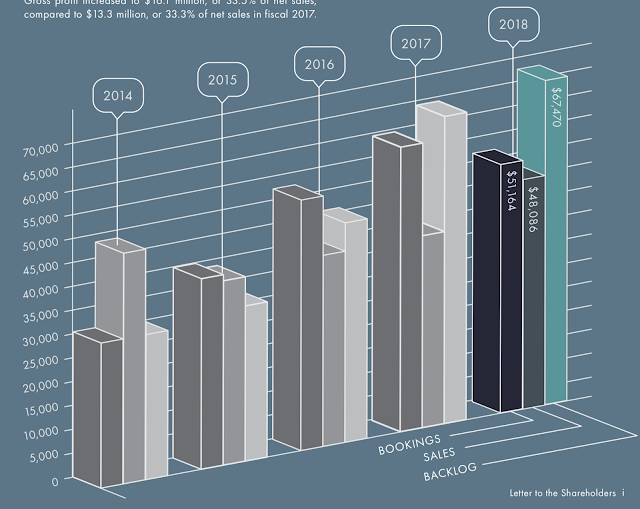 Whats the book value per share? Another way is to take average earnings of the last years. A business cycle takes about 8 years. Based on a list that I receive monthly from Ruerd Heeg (at seekingalpha), the price to 8 years average earnings ratio is 0.91, so you pay a bit less than 8x average earnings (of the last 8 years). You dont have to deduct any debts because we are taking about net-earnings (after interest and taxes). This is cheap but not very cheap. (The cheapest stock in U.S. based on this multiple are SIAF and CLD). However, good points are that the stock is at a multi year low, the nano size and low outstanding stock amount. It is rather a bet that the investor sentiment will improve. Another nano stock idea is APWC. Interesting is also the stock investment checklist. I understand that you like to buy stocks at a multi-year low. There is evidence that buying stocks at a 3-5 year low is a good idea (see here: https://www.ivey.uwo.ca/cmsmedia/3775550/return_reversal_in_uk_shares_oct_2006.pdf). Should a stock be at a 3, 5, 10 years or all time low. Any thoughts about this?